Gutters and downspouts are crucial for properly directing runoff away from your home. They help minimize or even eliminate water damage to your foundation, siding and windows, while adding a finishing touch to the design of your home. Dayton Home Improvement offers gutters and downspouts in a wide variety of colors and materials. 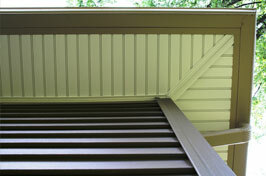 Our gutters and downspouts are custom-fit to the unique contours of your home. This ensures that your finished product will not only be functional, but also attractive. Combine your new gutters with our Leaf Relief™ system for a no fuss, beautiful drainage system. You’ll never have to clean your gutters again. Find out how .